It's location was awesome and convenient. It's located at a few kilometre from the Railway Station. It's well-designed hotel, ambience is good. Rooms are luxurious with all modern facilities. Ultra modern amenities are well-stuffed. Food is tasty and healthy. Staff were cooperative and excellent at room service, it's not costly a budget friendly hotel. Definitely recommendable one if you are in Bangalore. The worst rooms I have ever seen in my life, no fan or AC was not working, no proper management, room service was pathetic, even hot water was not available. Overall worst hotel. WRITE A REVIEW Reddy, Manjunath, Sunil and 607 other people have rated this hotel. Have you stayed at Ajanta Hotel? Hotel Ajanta Bangalore is a popular destination for many travellers for an all comprehensive package they offer. Hotel Ajanta is located on the MG Road thereby making it easily accessible from any part in the city. The pricing of the rooms makes it attractive for the sightseeing population and the person on work. The north and south Indian delicacies offered at the restaurant of Hotel Ajanta makes it a popular head out place even for the locals. To add to all this charm, they also have a banquet facility to host from 150 to 600 people. Shopping and eating out is a treat to anyone who stays here. Book your stay at the Hotel Ajanta easily with Holiday IQ. 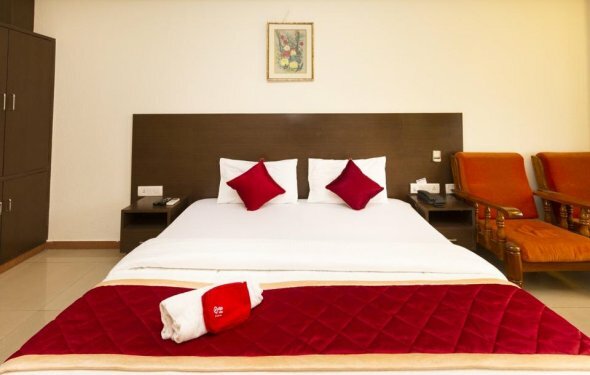 Ajanta Hotel offers AC and non-AC guest rooms categorized into Deluxe, Cottage and Executive. The rooms are of single and double occupancy. The room amenities include television and hot water facility. Ajanta Hotel has an in-house restaurant serving Indian delicacies. The other facilities are doctor on call and travel desk. Car rental and car parking are arranged for the guests. The hotel has a conference hall. Laundry service is also provided for the guests. Ajanta Hotel is located in the M G Road part of Bangalore. There are 327 traveller reviews for Ajanta Hotel. The minimum tariff for Ajanta Hotel is Rs.1, 800 and the maximum rate charged is Rs.2, 400.